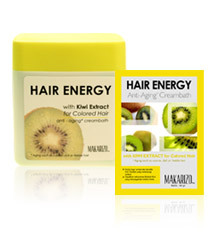 Formulated for hair that has undergone chemical processes like rebonding, perming, coloring and bleaching.Kiwi extract is useful to give hair the nutrition it needs for chemically treated hair. It also acts as an antioxidant that protects hair. Kiwi extracts contains Vitamin C, E and Kalium to keep moisture of the hair balanced and leaves hair shiny and soft to the touch. so, as you know i kinda did impulsively bleached the end of my hair. tho i am loving the color, it's the process left my hair with bone dry bitchiness. frizzzzzzzz. then somehow i see this product when i did my groceries shopping. then i think ... "let's give it a go". after i used it, my hair feels so fluffy and soft. FRIZZ FREE!! the thickness of the product is excelent. it just spreads and just cling to your hair, making it easy to apply. overall experience was just similar to hair treatment at the salon (minus the complimentary shoulder and neck massage, of course). - .... nope, can't find any. first time ever hair treatment review. just a friend to another.